Whitney Vickers | Greene County News Marc’s — an Ohio-based grocery store — has opened its first area location at 2100 E. Whipp Road in Kettering. It features more than 5,000 products including home supplies, food, Ohio-grown produce, a closeout section featuring marked-down items and more. The store opened to the public Aug. 8. A ribbon cutting event that included store and Kettering city officials was held Aug. 7. 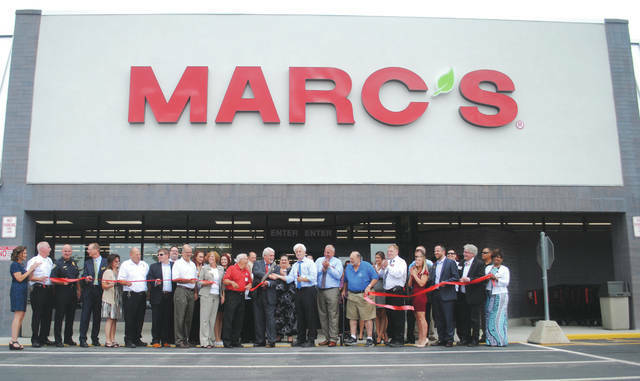 Marc’s — an Ohio-based grocery store — has opened its first area location at 2100 E. Whipp Road in Kettering. It features more than 5,000 products including home supplies, food, Ohio-grown produce, a closeout section featuring marked-down items and more. The store opened to the public Aug. 8. A ribbon cutting event that included store and Kettering city officials was held Aug. 7.
https://www.beavercreeknewscurrent.com/wp-content/uploads/sites/49/2018/08/web1_marcs1.jpgWhitney Vickers | Greene County News Marc’s — an Ohio-based grocery store — has opened its first area location at 2100 E. Whipp Road in Kettering. It features more than 5,000 products including home supplies, food, Ohio-grown produce, a closeout section featuring marked-down items and more. The store opened to the public Aug. 8. A ribbon cutting event that included store and Kettering city officials was held Aug. 7.